I decided that this project is growing significantly, and is important enough to warrant it’s own separate page, so that after I post a spotlight, it will be archived here as well. That way, you history buffs can come to one location to see them all. As with most blog posts, the most recent one will be on top, and the older ones at the bottom. Thus, Henry Miller, my first spotlight will be at the bottom. None will be added here until their month is over. In my previous spotlights, I have featured places. I am working on one featuring a person and one featuring an area, but this month, I want to feature an inhabitant that was on the brink of extinction and which is now having a comeback, due to the efforts of so many, but particularly the Ventana Wildlife Society. The idea for this monthly spotlight came from a great photo sent to me by Dan Danbom, who has given me permission to write this article around his photographic studies. The California condor is the largest flying bird in North America. Their wings may stretch nearly 10 feet (3 meters) from tip to tip. When in flight, these huge birds glide on air currents to soar as high as a dizzying 15,000 feet (4,600 meters). They can live up to 60 years in the wild, and mate for life. They are very social animals. Like other vultures, condors are scavengers that feast on the carcasses of large mammals, such as cattle and deer. When a big meal is available, the birds may gorge themselves so much that they must rest for several hours before flying again. Two of the Condors were lost in the Basin Complex Fire of 2008, here in Big Sur, despite herculean efforts by the VWS to save the condors from the fire. **HELP FIND A MISSING CONDOR** 6:30 pm, 4/2/10 – I just got a message that Joe Burnett, a biologist for the VWS who works with and monitors the condor recovery program, is worried about a missing condor. He is the oldest male here, and has been living in Big Sur for 11 years. missing bird #204 – tag shows #4 with two white dots partner #222 – 22 with two white dots. According to my source, he (Joe) sounded pretty concerned, Joe thinks the bird may be sick and may have crawled into a shed or the area behind one, probably in area of Partington. If you spot this condor, call the VWS immediately, and let them know where he was spotted. Do NOT try to rescue the bird yourself, let the professionals handle it. And get the word out to your neighbors, if in Partington area. Thank you. Thursday night, TreeBones Resort, owned by John & Corinne Handy held their second in the annual Big Sur Legends Series to raise money for Pacific Valley School. One entered the lobby, and there was the guest of honor, Don McQueen. Further in, the items for the silent auction. This is just a few of the many items available to bid on. The resort lobby and dining room was decked out for the occasion with lovely table settings, and tables that would eventually fill completely as dinner was served by the students of Pacific Valley School, all of whom were dressed in black. They looked so classy and did an incredible job of serving the 70 of us in attendance! There were appetizers, Heller Estate donated wines that were poured by Mary Roos; a salad from the gardens of TreeBones; but the piéce de resistancé was the filet mignon with pomegranate demi glaze served over garlic mashed potatoes with steamed asparagus. I have never seen a filet that thick, 2 to 3 inches, or one that literally melted in one’s mouth like that one did. I am only sorry I did not think to take photos of the food. I see food — and I just want to eat! And I am informed that Chris won the People’s Choice award at the recent Chanterelle Cook-Off. Congratulations, Chris, and eating food you have prepared is such an honor! Oh, and the dessert? It was created and donated by Margaret Graham Doyle. It was a wonderful date pudding with hot caramel sauce. Yum … when my student waitperson tried to take it away before I finished that last bite, she realized she would risk my wrath. Throughout the evening we were treated to live music, some performed by the students themselves. But the “fireside chat” between John Handy and Don McQueen was what most of us came to see and hear. Don McQueen, a Big Sur Legend, and one of our elders. Don started the Big Sur Campground in 1953 with Walter Trotter. Now, reservations for this icon are 18 years out. But the project in Big Sur that Don built that he is most proud of is Fernwood, and that project he did for free. During the Basin Complex Fire of 2008, Don called Caterpillar Company and order a $200,000 cat on credit. They delivered it to him in 16 hours and 15 minutes. I asked him about this, and he replied, “If I didn’t do that, I would have lost everything.” And from what I hear from his friends and neighbors, they also would have lost everything, but for Don and his cat. “We have too much traffic already.” I’m with you there, Don. Even the wagon trail that passes for a road up to my place gets crowded during the summer. Fortunately, every so often, Mother Nature, when she’s had enough, closes the highway. Thank you, Don, for the stories, the sharing, and for being an elder in our community, and a Big Sur Legend! The Double Cone Quarterly published some incredible articles about the history of the Monterey District of what is now known as the Los Padres National Forest. Tom Hopkins, current president of the VWA suggested this series for my history spotlight, and for that, I am extremely grateful. There are the five articles which will be spotlighted in this post. I will provide a “lead-in” and a visual for each one, and then a link where my readers can read the rest of the articles. The first article is about the proclamation made by President Teddy Roosevelt. provides some wonderful history and observations from the early 1900’s by residents about fires and campers. This article begins again with the proclamation by Teddy Roosevelt in 1906, and then traces the subsequent federal actions for the next 96 years through 2002, and the acquisitions and designations which occurred. And that is our Big Sur History lesson for February. I really urge you to check out each article for links to the Library of Congress map and other historical documents, and to the last two lengthy articles. I hope you enjoyed them as much as I did. Post Ranch Inn began with a handshake in 1984, but the history of the ranch goes back to 1848, when 18 year old William Brainard Post stepped off a ship in Monterey. A spirited explorer and entrepreneur, W.B. Post spent his early years on the California coast where he hunted grizzly bear and deer. Later he became a businessman, starting the first grain warehouse in Moss Landing and the first butcher shop in Castroville. In 1850 William Brainard Post married Anselma Onesimo, of Costanoan descent, with whom he had five children. This is probably the only photograph ever taken of Anselma Onesimo, a tintype found in a family bible. When he took out a claim on 160 acres of land in Big Sur, he became one of the region’s first homesteaders. With the help of his sons, he built a cabin. The red New England-style house, a registered historical landmark, still stands on Highway 1 across from the entrance to Post Ranch Inn. The Post family raised cattle and hogs, and exported apples from a thriving orchard. W.B. and Anselma’s youngest son, Joe, married a neighbor, Elizabeth Gilkey. Joe eventually bought up claims from both of their families, accumulating nearly 1,500 acres, including the area of Post Ranch Inn. Together the adventurous couple ran the ranch and took hunters and fishermen on pack trips into the wilderness around Big Sur. Lizzy and son, Bill, Billy Post’s dad. Their son Bill continued the family tradition of leading trips and working as a cowboy and rancher. While employed as the mail carrier from Monterey to Big Sur, Bill gave a ride to Irene Fredricks, a city girl whose romance with Bill turned her summer visit to Big Sur into a lifelong stay. The couple opened Rancho Sierra Mar, a small resort and café near the Post Family home, which they ran with their two children, Billy and Mary. Billy’s parents, Irene and Bill Post in front of the Rancho Sierra Mar Café, which is now the maintenance building for Ventana Inn. 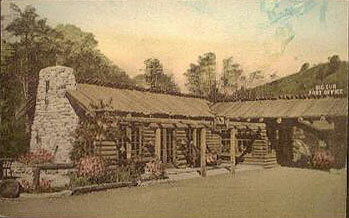 It was in honor of this first family restaurant that the Post Ranch Inn’s Sierra Mar Restaurant was named. Born in 1920, Bill Post lived in Big Sur most of his life, and there were many chores on the self-sufficient homestead. After serving in the Marine Corps in World War II, Bill came home to run the ranch. He was raising two daughters on his own when he met and married Luci, the love of his life. Joe branding a steer, Bill’s dad on the horse. Billy and Mary Post at a cowboy dress party at the old barn, which was where the parking lot to Ventana Restaurant is now. Over the years, it grew difficult to hold on to the old style of ranching. In the early 1980s, a close friend and neighbor approached Bill and Luci with the idea of turning the land into an inn that would preserve the integrity and history of the Post family’s property. After shaking hands on the deal, they sealed the Post partnership with a shot of Jack Daniel’s, which has since become the Inn’s unofficial drink. a Post family project in more ways than one. It was Luci’s idea to honor the early history of Big Sur by using the ranch’s cattle brand as the Inn’s logo, and she put together the library. Bill named each guest room in honor of the Post family and Big Sur pioneers. Bill and Luci Post at the entrance road to the ranch after it first opened as an inn. 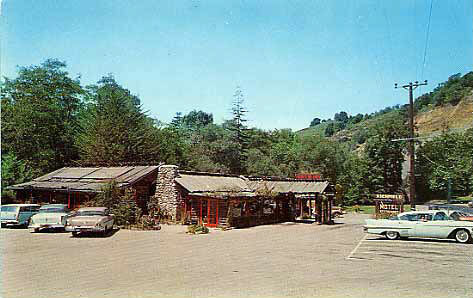 Bill’s sister, the late Mary Post Fleenor, ran the Rancho Sierra Mar Café until it closed in 1972. On its opening night in 1992, the Sierra Mar Restaurant was dedicated to Mary’s memory. Bill Post, a loyal steward of this land for almost 90 years, was an exceptional and irreplaceable host for thousands of inn guests for seventeen years. We have the privilege of enjoying this soulful and historical property because of his generosity and foresight to make it available to guests. Bill’s gentle and genial hospitality remains an inspiration to all of us at Post Ranch Inn. Article written by Soaring Starkey, Post Ranch Inn Historian. Historical photographs from the collection of Joseph William Post III. The place we call the Big Sur River Inn dates from 1888 when Jay Pheneger acquired a 160 acre parcel from the federal government and gave his name to the creek that bounds the River Inn on the south side of the property. Barbara and Michael Pfeiffer, who had already homesteaded and were farming near Pfeiffer Beach purchased the Pheneger property. 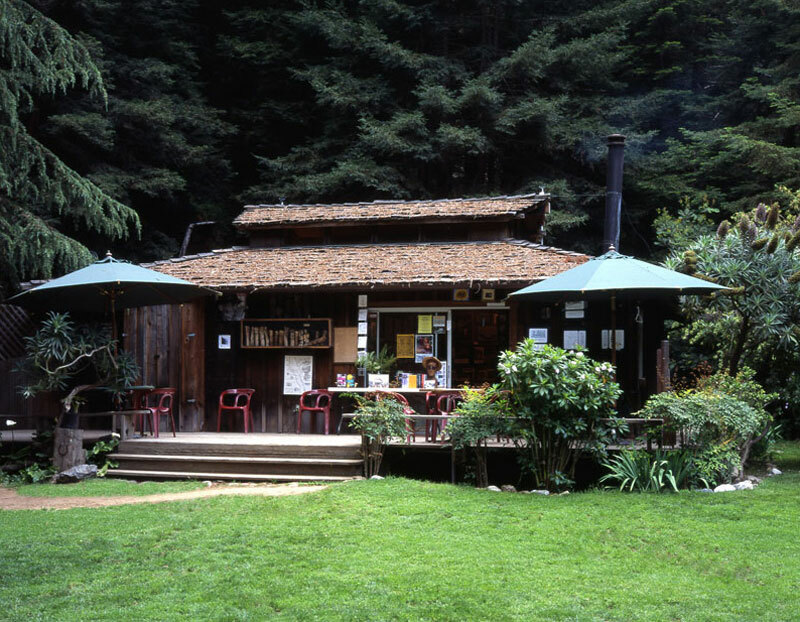 In 1926 John – Michael and Barbara’s son – took over the land on which The Big Sur River Inn now stands and his daughter, Ellen Brown started the River Inn in 1934 – on the east side of the road. 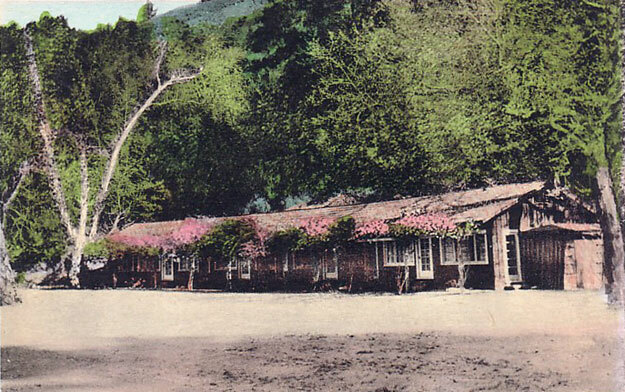 She opened her living and dining rooms to the public and began serving “Hot Apple Pie.” Lodging units were built and Big Sur’s first resort was established. Her famous Apple Pie, which is still on the menu today gave the place it’s first name … “Apple Pie Inn.” The ridge that rises above the east side of Highway One, behind the Inn is still known as Apple Pie Ridge. When Ellen left Big Sur in 1937 her mother Florence took over the Inn and as the paved Highway One between Carmel and the Hearst Castle was completed, Ellen’s house was moved to the west side of the road. The home was converted to a dining room and kitchen. Gas pumps were installed and the name was changed to Redwood Camp. In 1943, Florence’s daughter, Esther Pfeiffer Ewoldsen and her husband, Hans took over the operation. In Esther’s own words … “the place was renamed ‘The River Inn’ in hopes of keeping the river out … because in those days the river often rose up during the winter storms to the level of the dining room door.” Esther replaced her mother as Big Sur Postmaster (Esther was careful to point out the title is not Postmistress… but Postmaster) and the Post Office was moved to the River Inn, situated where the HeartBeat Gift Gallery is today. After some extensive remodeling and before he reopened for business, Hans did a traffic survey by standing at the Highway; for one whole day to count cars. “Seven went by,” he reported, “and every one stopped for gas.” So he knew that the enterprise would be a success. With lots of help, Hans built the General Store and lodging units ten through fifteen. He rebuilt the dining room and “fixed it up fancy.” Esther reminded us that there was a bridge crossing over it. People admired the “indoor bridge” and stopped by again and again to see it. The Pfeiffers and the Ewoldsens started a tradition at the Big Sur River Inn of fine food, excellent service and warm hospitality. In 1988 a small group of family and friends purchased the Big Sur River Inn and continue the Pfeiffer tradition of welcoming locals and visitors alike to our little piece of paradise. Magnus Toren of the Henry Miller Library was the first to send me a completed history and the first photo shown below. So, featured this month is the Henry Miller Library!! I have been promised three more features from local businesses, and am working on contacting as many as I can to continue the Monthly Spotlight for quite some time. 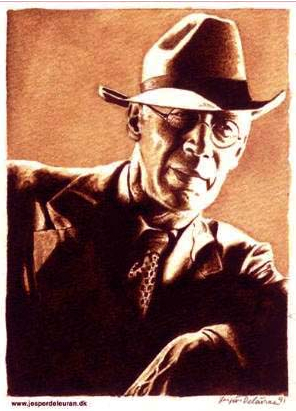 The Henry Miller Library (also known as the “Henry Miller Memorial Library, Founded by Emil White”) was created by Emil White, a longtime friend of Miller. Located in Big Sur, 35 miles south of Carmel-by-the-Sea on Highway One, the Library occupies White’s former home. It is a public benefit, non-profit organization championing the literary, artistic and cultural contributions of the late writer, artist and Big Sur resident Henry Miller. Emil White moved to Big Sur in 1944 to serve as caretaker and personal secretary to Henry Miller. The two had met in Chicago in 1942. In the 1960’s White bought the property, a lush meadow surrounded by towering redwoods, on which the Library now stands. The main building was built in 1966 on the site of the Graves Canyon landfill created during the construction of Highway One in the 1930’s. The caretaker’s cottage adjacent to the main house was added shortly thereafter. Other changes have been made piecemeal since 1981. After Miller died in 1980, Emil decided to maintain his property as a memorial to his friend. In 1981, with the assistance of the Big Sur Land Trust (BSLT), he converted his home into the Library. Emil spent the rest of his life as director of the new institution, which since has evolved into a local center for the arts. In 1997 the Library staff, with the blessings of the BSLT, began the process of becoming an independent 501(c) 3 organization. That process is completed. 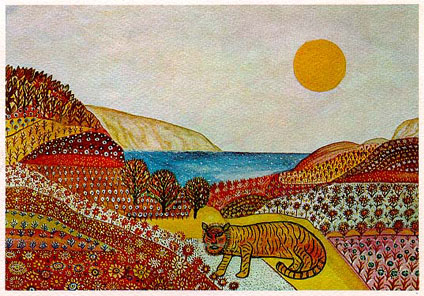 Miller lived in Big Sur until 1962, when he moved to Pacific Palisades, where he resided until his death in 1980. History and first photo provided by Magnus Toren, curator of the HML. Second two photos creative commons and fair use. Thanks, so much Magnus for helping me kick off this new feature!! Big Sur Kate … I am so happy to visit your site, whenever I do! This SPOTLIGHT series and History is SO WONDERFUL! E MA HO (“How wonderful!). I visited your site today, September 9, 2010, because of the horrible FOURMILE CANYON FIRE which is raging away in the area just West of Boulder. I live in Lyons, 14-miles (or less from the fire) North of Boulder. In 2008 I was in Big Sur for about five days, for the “Big Sur Rising Festival,” at the end of July. As Director of the “SAMSARA Meditation & Healing Ensemble of Planet Earth” I was traveling with my friends and colleagues Shree Khrisna Shahee, Santa Ratna Shakya, both from Kathmandu, Nepal, and with Rika Takahashi from Tokyo, Japan. In Nepal and other places Shree and Santa concertize as “The PeaceMakers.” When we are together we are SAMSARA! We gave several concerts in Big Sur at the Spirit Gardens of Loma Vista and during the weekend festival to celebrate the end of the 2008 fire. Today, this Fourmile Canyon Fire, which is a Type 1 incidnet (National Priority) is still only about 15% contained, in about a 12-square-mile area, over 140 structures and homes have been destroyed, and the battle and area wide evacuations of over 3000 people continues, with now, today, just 3 of 29 Subdivisions being allowed a Provisional “Un-Evacuation” as our wildfire fight here continues. Your site is the very best site I have ever visited for ALL that you do. Thank you so much! E Ma Ho and Kindest regards, Sapan Rinpoche, Lyons, Colorado, USA, North America … BTW, I plan to return probably in 2012 to do a concert [Himalayan Singing Bowls, etc.] at the HML, which I fell in love with in 2008! CHEERS! Hi Kate….I have the best time visiting your site. Thanks for this excellent and much needed repository if Big Sur history. ps; are you related to a fellow/drummer in Cambria/SLO name of Tim Novoa? I learned of your website recently when I heard you interviewed on a radio program. It’s very interesting and informative! Regarding Big Sur history, I’ve been curious a long time about a minor point, and I haven’t found the answer. Decades ago, when I was driving past the Point Sur Lighthouse, I saw a small airplane take off from a short airstrip on the lower level of the site. I wonder not only why airplanes flew there, but also whether the airstrip is still active. Do you know anything about that? Decades ago, that flat land below the lighthouse was part of the El Sur Ranch. It would not surprise me if there once was a private strip there for the ranch. Also, on the southern end was a Coast Guard station, that is now closed. There could have been an airstrip there, as well. That area between the two was used for landing helicopters during the Basin Fire. As far as I know, that strip has not been active for some time. I haven’t been interviewed on the radio in some time. My guess is it was KUSP. Hey Kate. If you ask Celia Morgenrath, I gave her an original Big Sur guide with Emil Norman’s artwork describing the hwy. I have 2 original Emil White paintings, I believe they are water colors. Does anyone know anything about his artwork? I am looking forward to learning more. Emile started and ran the Henry Miller Library. It was Emile’s house, and was full of his works when I met him. You might check with Magnus Toren. Wow, these comments bring back memories. If I remember correctly, Don McQueen lived in Pfeiffer Canyon near the Brazils, and very close to the 15 acres that my parents (Evon “Gus” Till & Adele Till) bought as an investment along the creek. Oh I wish how we still owned that property. The Post family had one of the first televisions in Big Sur. We used to sit at the bar on Wednesday evenings and eat their famous hamburgers, and watch the Mickey Mouse Club when it first broadcasted in 1955. They could receive the TV signal from a station in San Luis Obispo, all in B&W of course. I also have fuzzy memories of hearing stories of Bill Post building structures that were used during nuclear bomb tests in the Nevada desert, which were of course destroyed. Henry and June Miller were friends of my parents , and I went through grades 1-3 with their son Tony at Big Sur Grammar School. Woops, my memory is fuzzy after 60 years. It was the McChesney family that lived in Pfeiffer Canyon, near the Brazil family. I do remember the name Don McQueen. My grandparents – George & Francis Phillips owned Redwood Lodge, but we lived in the state park. Perhaps you are trying to recall the Makowskis who live about a mile down the canyon. The McChesneys lived in Forest Service housing.